We’d love your help. 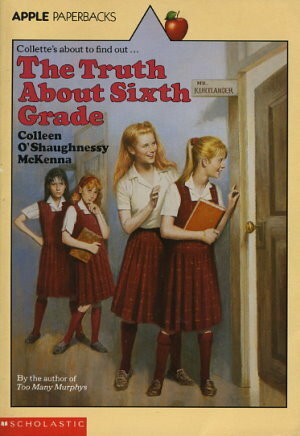 Let us know what’s wrong with this preview of The Truth about Sixth Grade by Colleen O'Shaughnessy McKenna. A realistic portrait of the pains and pleasures of growing up. Collette Murphy wins the friendship of some popular eighth-grade girls when Collette's handsome teacher, Mr. Kurtlander, gives her special attentions. But Collette learns that it is not easy juggling her new "friends" with her longtime friends. To ask other readers questions about The Truth about Sixth Grade, please sign up. Read this ages ago back in the days where I had literally read everything on my bookshelf. A former elementary school teacher, Colleen O'Shaughnessy McKenna lives in Pittsburgh with her family. She is best known for her Murphy series, based on her own family.